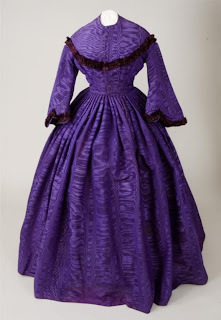 Today’s dressgasm is this lovely rich, deep purple dress from the early 1860s. I know very little about this dress or where it came from but I believe the fabric is silk moiré with deep burgundy trim looping around the shoulders and bust, and edging the simple pagoda sleeves. It appears that the bodice is hook and eye front closure. The cut and design of the dress is rather simple and universal among daytime clothing for women of the period, but it is the fabulous silk moiré that makes this piece outstanding. The types of fabric available to people in the nineteenth century were much more limited than today. I generally divide the four major fabric groups into cotton, linen, silk and wool. These fabrics were often blended together for appearances, cost effectiveness or sturdiness. Silk was the most expensive of these fabrics and there were several types such as moiré, watermark and taffeta. I see taffeta far more often than other types of silk. Silk in general was a sign of style and wealth, and every woman no matter her economic class aspired to own a “silk,” which was how they referred to these dresses. This dress, made of silk moiré, was most likely worn by a woman of decent wealth. My interpretation is she either had it designed in a simple style to let the fabric take center stage, or she had saved the money to buy her “silk” and couldn’t afford much embellishment. Victorians, by definition, decorated and embellished everything that would hold still within an inch of its life, so I find this dress fascinating in its simplicity. It speaks to me more because the woman who wore it didn’t overdo it. I imagine her to be unselfish, lacking vanity and being thankful for the life she led that allowed her to afford such a stunning piece of rich purple silk moiré. >Now THAT is a lovely dress. I love its simplicty. Yet it is so very elegant.